Many of you know that my lifelong dream has been to visit Hawaii. I’m not exactly sure why, but since approximately birth, or perhaps 4 minutes post womb-exit, I have been drawn to all things Hawaiian. Let me explain… Favorite flowers? Plumeria, hibiscus, orchid (okay I like peonies too but I’m staying on theme here). Favorite plants: bromeliads, palm trees of all varieties. Favorite flavors: piña colada, pineapple and coconut separately, mango, guava, passionfruit. Favorite food: (all of them, but some are:) crab, ahi tuna, lobster, scallops. Getting really specific, favorite nut: macadamia. 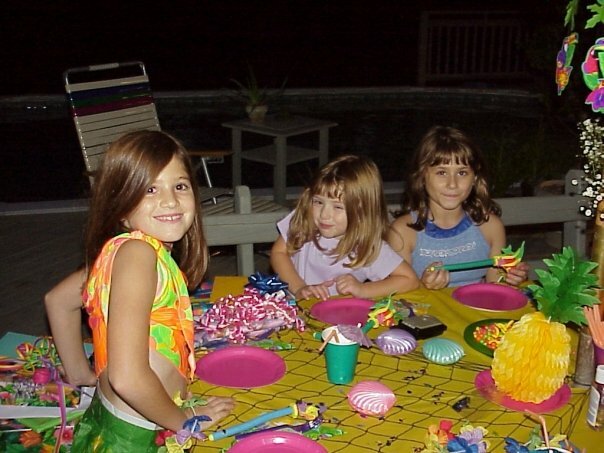 Favorite theme party: luau. Favorite place: beach. 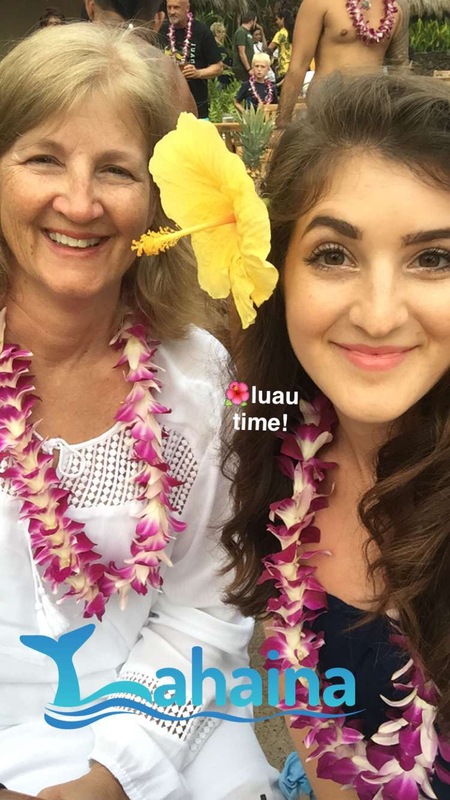 When I was seven years old, I told my mom it was my lifelong dream to go to Hawaii, in an effort to not-so-subtly persuade my mom to take me on a tropical vacation before I had even survived a decade on this planet. My priorities were ALIGNED. To really drive that point home, I threw a luau birthday party for myself the next year, donned a grass skirt at grandma’s pool, queued up a Don Ho CD (thanks, grandpa), and made enough virgin piña coladas to fill a bathtub. Even at eight years old, I wasn’t f***ing around. I have been on some incredible, beautiful vacations. In college I was lucky enough to visit Paris, the Bahamas, and Cabo (less beautiful vacation, more wild debauchery I will blur from my memory). In the past few years, I’ve visited Aruba, Miami, and Tulum. 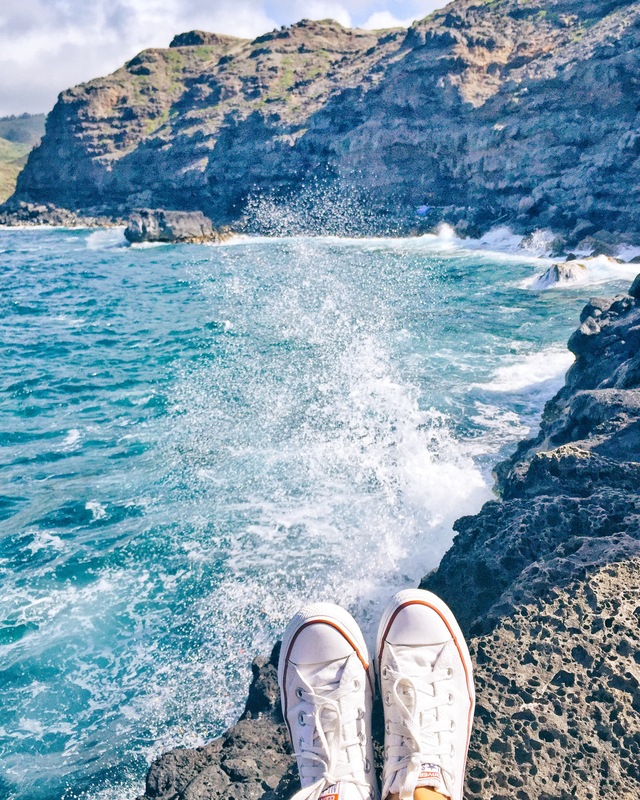 Each of them were so special, but hands down, Hawaii has my heart… and I’m not surprised. It feels like it was fate. The island itself was like “Dominique, The Theme Park.” Even the women’s bathrooms at the Kahului airport were marked “Wahine,” which embarrassingly enough was my AIM name: teeniewahine06 (stop judging me jeez). There were two Starbucks, and unlike the ones on the mainland, both of them had coconut syrup. YES. Everything there was perfectly crafted to my tastes, preferences, loves, and obsessions. Like I dreamt it, and someone made it real for me — but even better than the dreams. Beyond magical, beyond exquisite. 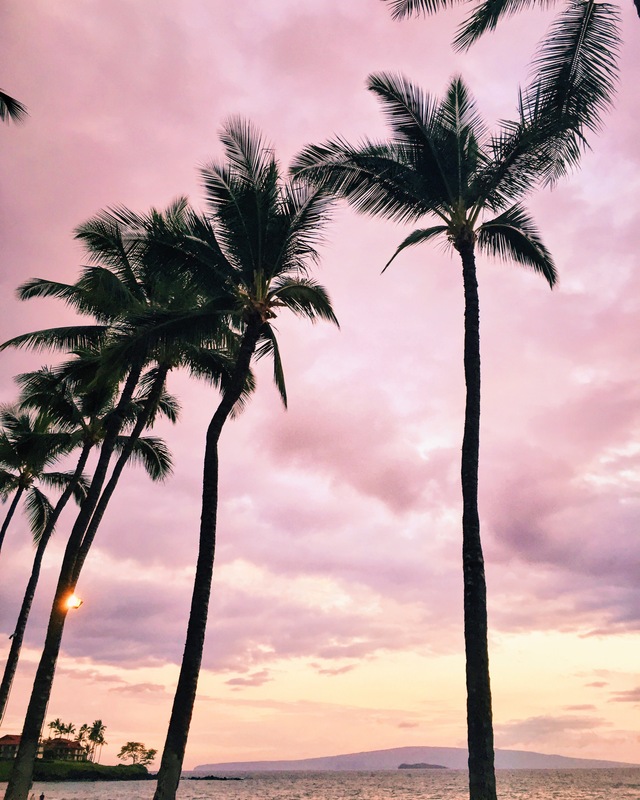 Hawaii is perfect. I’ll stop gushing and get into the specifics, but I wanted you all to know how much this trip meant to me, and how much this place means to me. My mom surprised my brother and I for Christmas by offering this trip in lieu of wrapped gifts (I obviously broke down in tears). We sat together and planned our dates and booked our travel and it was glorious. Here’s how I prepped, what we did, what we ate, and what you should try. Although I usually brush off guidebooks and consider them outdated (I like to do all the planning myself, through months of thorough internet research), this particular guidebook was SO amazing, helpful, and convenient. Even more so, it’s pretty funny, and I like the writer’s voice in here. 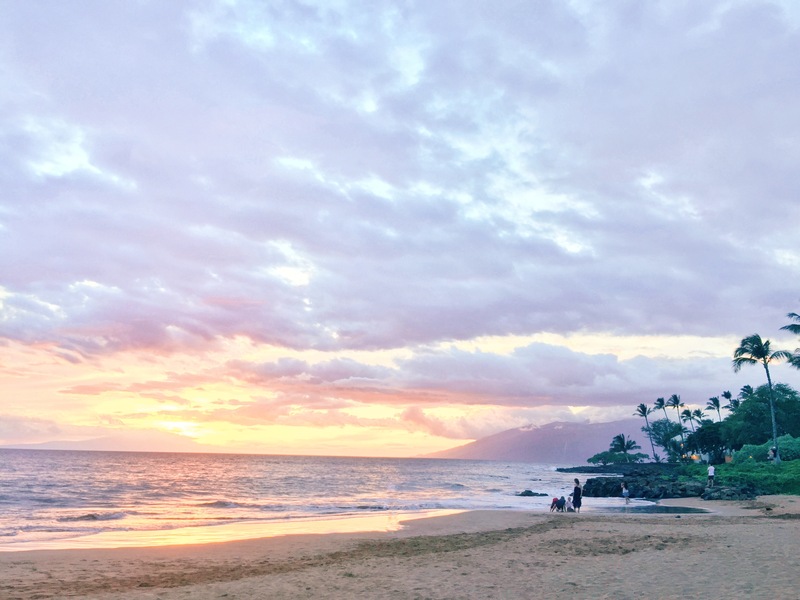 Maui Revealed: The Ultimate Guidebook is worth every penny of the $11 to $15 you’ll spend on it. Costco’s package afforded us a luxury vacation we never could’ve dreamed of. 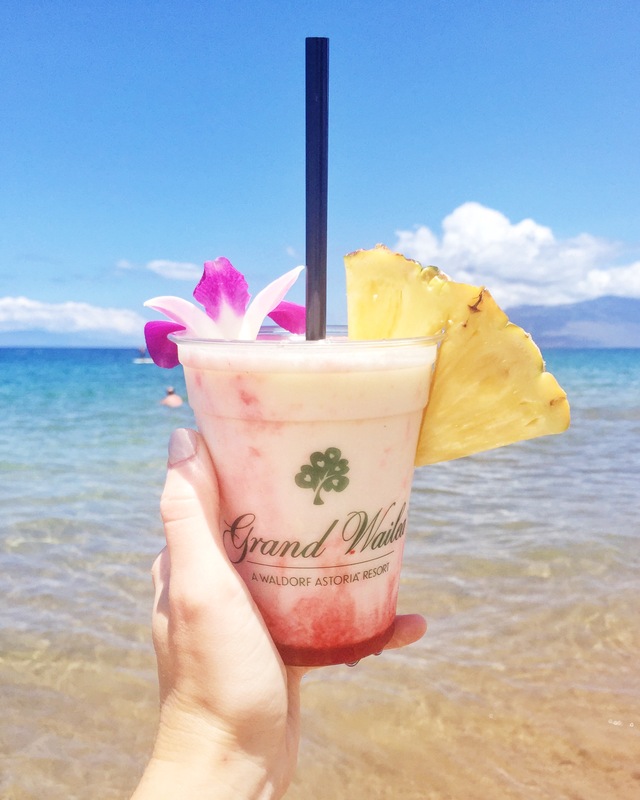 Through our insane deal, we were able to stay at The Grand Wailea (more on that phenomenal dream palace later), which would have been astronomically expensive otherwise. Our package came with a rental car, which was super necessary. If you don’t have a Costco membership already, I would recommend signing up purely for the travel benefits. I’m not kidding, guys. I think the basic membership is like $55 a year, and we saved thousands. 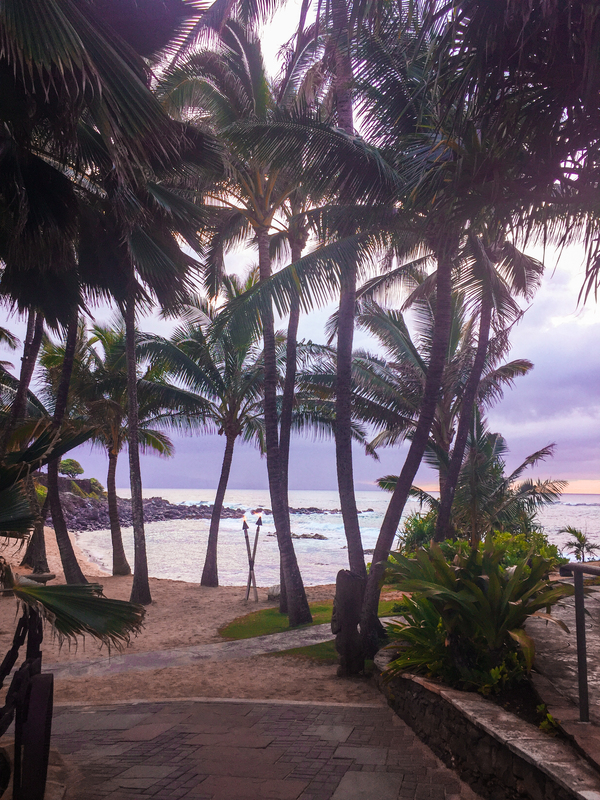 If you’re considering opening up a credit card for travel miles, consider Alaska (I haven’t done it personally, I just got the scoop): you get a $99 companion ticket each year, meaning you can bring someone with you to Hawaii for a hundred bucks every year. SCORE. I also brought some toiletries (obv), small bottles of SPF, a Chaco x Topo backpack, and a Hitcase waterproof phone case. I brought two rain jackets I didn’t need, too many shorts, and activewear that was unnecessary. I have said it before when talking about my trip to Tulum, but one of the best things I did for myself was get a full leg wax. Salt water + sweat + bug spray + sand + mud + sunscreen + open pores from shaving = bummer town. I also love not having to pack a razor or worry about shaving on vacation. I know it’s super weird to think about as a tip, but I’m telling you, it’s the best. I also tried to get a tiny bit of sun before I left SF (that was a challenge) so my skin wouldn’t totally freak out when it saw the tropical sun. Didn’t work, skin still freaked out. If you have the ability to get some safe and protected sun exposure before your trip, I’d recommend doing that. Lastly, I did a one-day soup cleanse to reset my diet and body before going on a several day binge. I actually liked it! Bought the one-day package from Splendid Spoon, and went for it on a Sunday, two days before the trip. Read more about it on POPSUGAR here. 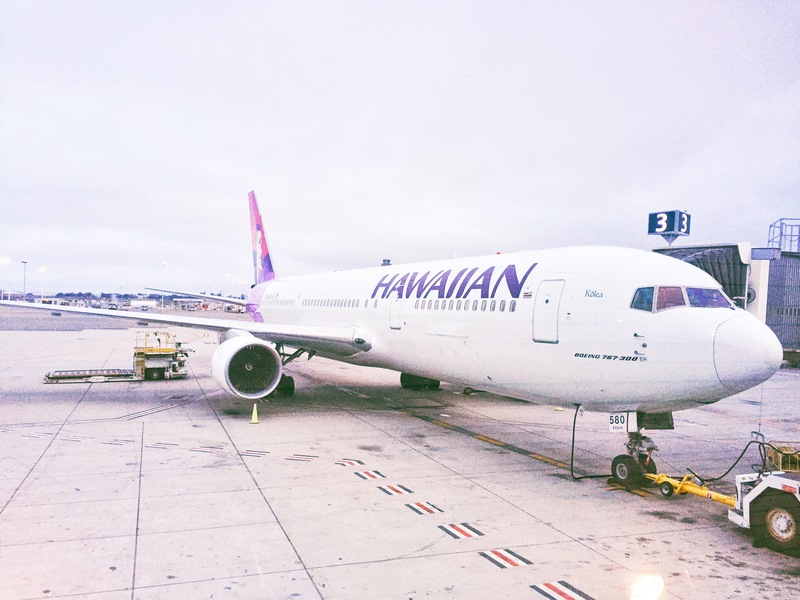 Hawaiian Airlines, my new favorite airline. Where do I even begin? I guess with the POG. On what airline have you ever received POG? Maybe on other airlines that go to Hawaii, who knows. You might. I don’t. Anyway. If you don’t know, POG, in addition to being LIFE, is passionfruit, orange, guava juice. Not sure of the actual juice content, but it’s delicious. It is served on flight just like ginger ale and tomato juice (my weird go-tos on other flights). I loaded UP on that stuff. 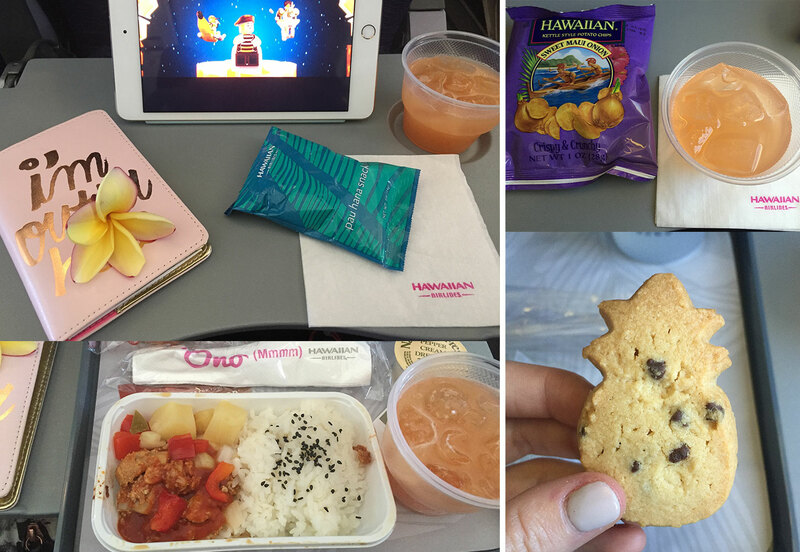 Hawaiian Airlines is the dreamy, themed air travel you’d expect from such a special place like Hawaii — and they’re one of the few airlines that still serves an in-flight meal. They have themed foods, like pineapple shaped cookies, coconut macaroons, pineapple stir fry, etc. You get plenty of snacks, and have the ability to buy premium ones: I got the Mele Macs, which are toffee and chocolate coated macadamia nuts, and also a reminder that Jesus loves me. I honestly thought I got better pictures… I’m so sorry. Yes I drank a gallon of POG and yes that’s the Lego movie that I paid for with my own money. The few screens on board show beautiful, breezy Hawaiian beaches and scenes, the chairs are purple (and VERY comfortable with lots of room), the staff wears blue Hawaiian-printed uniforms and the women wear flowers in their hair, the bathrooms have coconut scented soap, and there’s free rum punch before landing (that sh*t was strong). Some things you should be aware of with Hawaiian Airlines: no wifi on a 5+ hour flight. Awesome way to disconnect, but not so great when you don’t expect it. I brought my own iPad with downloaded movies, but for those who didn’t, there’s no in-flight entertainment (besides a few Hawaiian music videos they play for a small window of time), no screens on each chair, no movie, no free headphones, etc etc. Here’s how you counter that: bring a tablet or download a book to your phone (or you know, pack one of those old-school paper things they call books! ), and make sure your own entertainment is ready to go. I have the entire Harry Potter series downloaded to my iPad, but on the way there, I made a spotify playlist of 50 classic Hawaiian songs and made my playlist available offline. LET ME TELL YOU, it was the best decision I ever made. Sipping guava juice and cruising over the pacific, dreaming about my imminent relaxation and vacation, set to this music — it was a little piece of paradise before the big kahuna paradise. Holy. Hell. Or should I say, holy heaven? 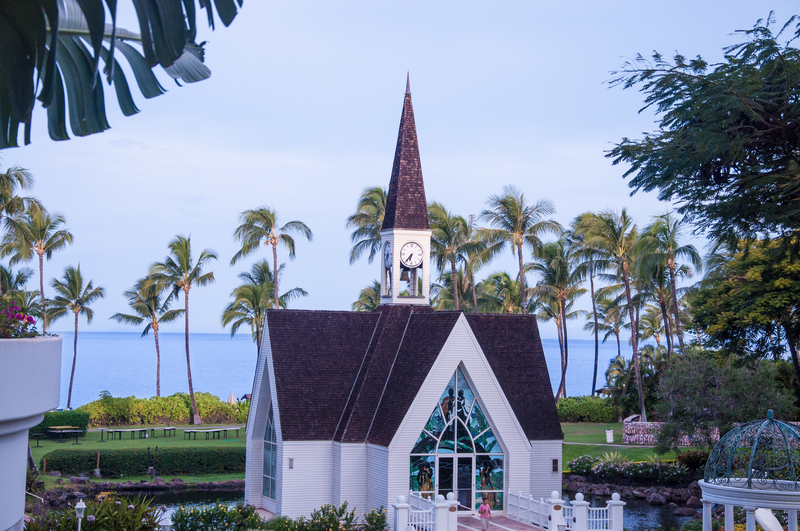 I can’t imagine heaven is too different from the beautiful peach-colored palace on Wailea Beach. 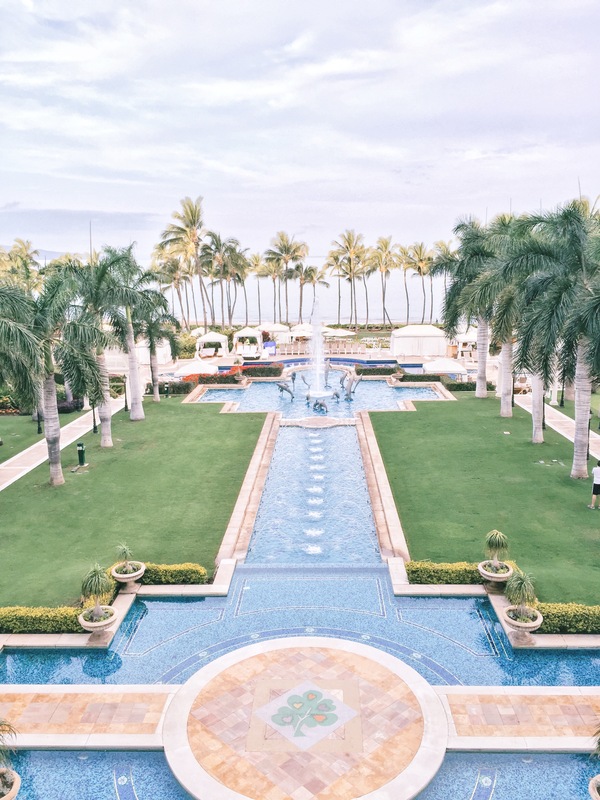 The Grand Wailea is hands-down the loveliest place I’ve yet to see and experience. Although I’m not a luxury traveler by any means (literally stayed in a tree house with no electricity in Tulum), I’m not sure how it gets any better. First off, the grounds and the lobby. 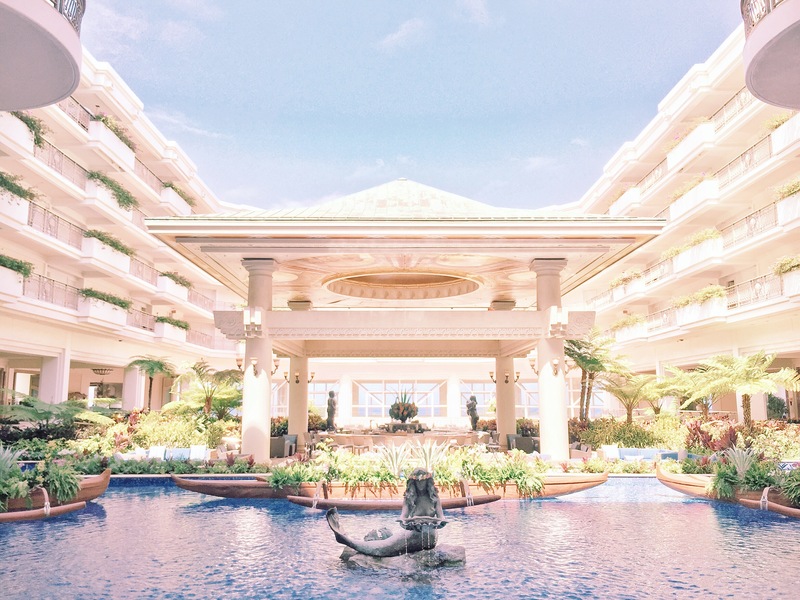 Every moment at this place was a dream, thanks to the immaculately kept grounds, lush tropical landscaping, beautifully manicured lawns, sprawling pools, skyscraping palms, and a pristine beach. In the spirit of “Dominique, The Theme Park,” the beautiful pastel palace greets you with “the Lucky Mermaid” who wears a crown made of flowers and sunbathes in the front pool. As I write this, I realized I made the grave mistake of NOT tossing a coin into the seashell she’s holding, AND NOW MY WISHES MIGHT NOT COME TRUE. Then the people. We were greeted by Kela, who cried upon seeing me cry (yes, I cried with joy upon checking into a magical resort on the shore of Maui, what are you going to do about it). She then proceeded to show us the most Aloha Spirit I’ve ever felt; she waived tons of fees, sent us a beautiful room service package, and treated us to several drinks and treats during our stay. It was the kindest, most gracious, most generous experience I’ve ever had in a hotel. We left a little care package of our own for Kela before we left, but I want all of you to know that there is an angel from heaven working at The Grand Wailea and her name is Kela and you should go there and be nice to her and just be in her presence because she is love. Beyond our experience with Kela, every single person we interacted with was delightful, warm, and kind. Exceptional customer service every moment of every day. The amenities were top notch; if I had wanted to work out (I didn’t), the gym looked like it was as nice as my Equinox gym at home. They offer sunrise yoga and $10 spin classes, so on my next trip there to visit my best friend Kela, I will probably check that out. And also the spa, if by some chance, I have won the lottery. As with most resorts, you can charge basically everything to the room. This includes merchandise at the shops (they have Lilly Pulitzer, Roxy, etc), all your drinks and food, and activities at the beach. They offer free 15 minute scuba intro classes (I unfortunately forgot about this, but it’s my priority for the next trip! ), and more intensive scuba programs in which you learn in their pool before going out into the ocean! The pool and the beach are gorgeous. The pool has a lazy river, which I brushed off as being tacky at first, before realizing it’s delightful. There are separate kids pools, a rope swing, water slide, swim up bar, jacuzzi, and mini beach in the pools. It’s like a water park except it’s classy af and you won’t get e. coli. At the beach, attendants set up umbrellas and chairs with towels for you. FOR FREE. You can rent kayaks, snorkel equipment, or do what I did and get a SUP board and do some awkward yoga by yourself out over the reef. All in all, this resort gets a 12/10 from me. It is the closest thing to heaven I’ve ever experienced. 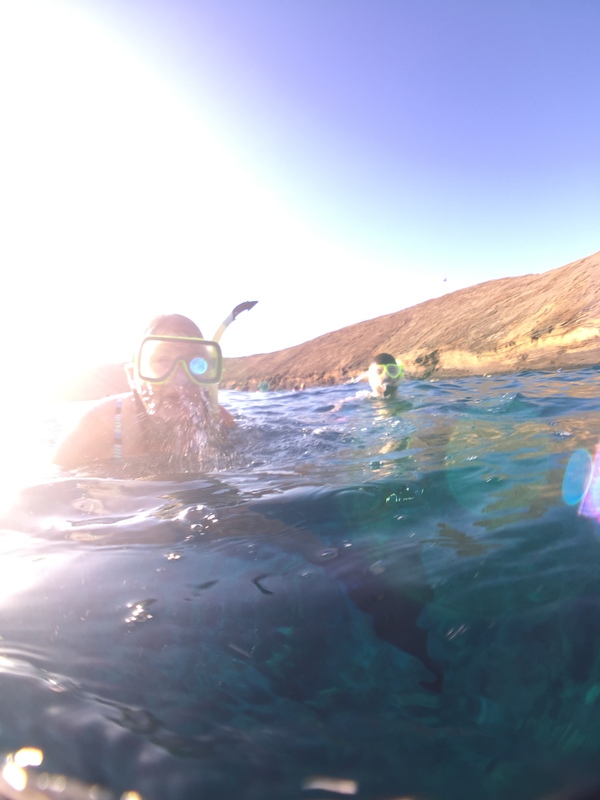 I love being in the water, and I love snorkeling. This trip was so worth the early AM wakeup call. We set sail with Kai Kanani Sailing at 6am from Makena beach, heading to the Molokini Crater for some early morning snorkeling. 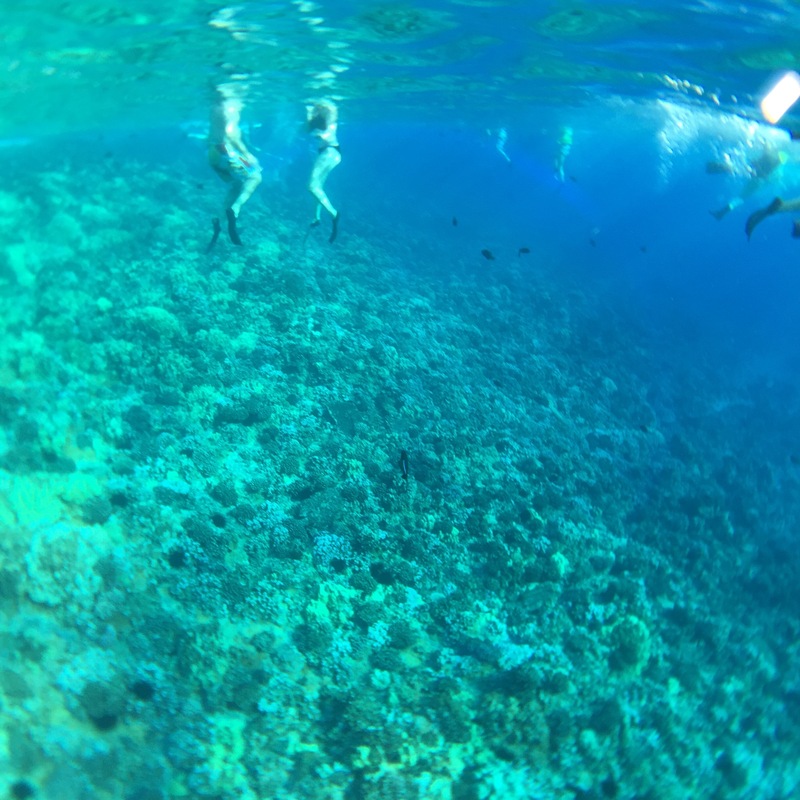 We swam through reefs and fish in the warm Pacific that felt more like bathwater as the sun came up. Kai Kanani provides muffins, POG, fresh fruit, coffee, and cocoa on the morning cruises. In addition to morning snorkel trips, they do sunset cocktail cruises, which I’ll definitely be trying on the next round. 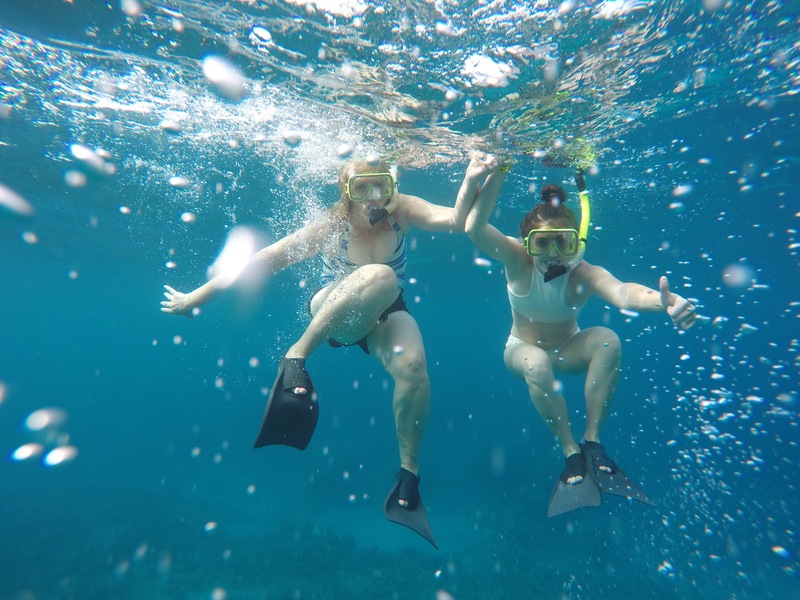 They also rent out GoPro cameras, and provide all the necessary equipment for your excursion, including floatie belts, boogie boards, etc, if you need them. 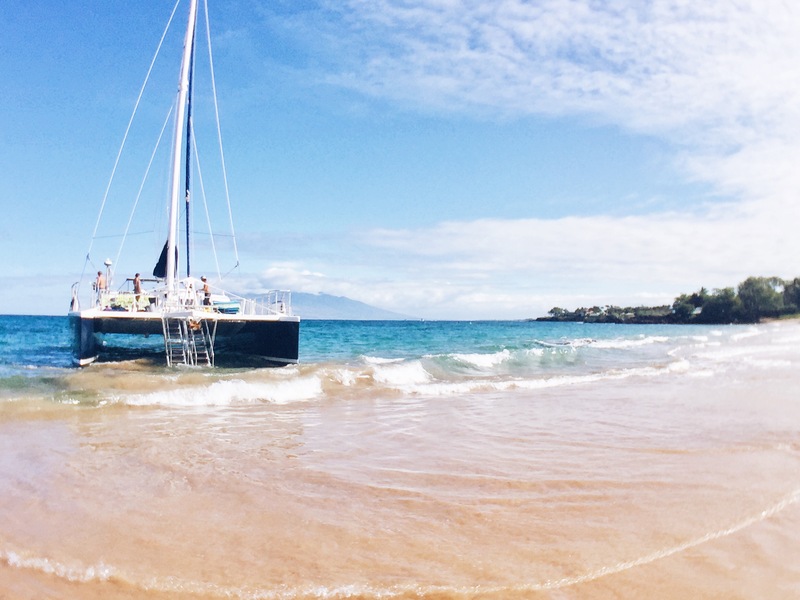 We were lucky enough to have beautiful Wailea Beach as our front yard at the Grand Wailea. As mentioned, the resort amenities made the beach very convenient and user friendly, but it’s just a beautiful beach in general. Capped on either side with lava rocks, smooth, soft sand stretching out, palm trees all around, views of West Maui (the Lahaina side) and Kahoolawe, and the clearest, deep blue water with unbelievable visibility to see the reef that’s just a little bit past the “break” of the nearly nonexistent waves. It’s swimming friendly, watersport friendly, and ideal. The main image of this post (right above “Before The Trip”) is Wailea. 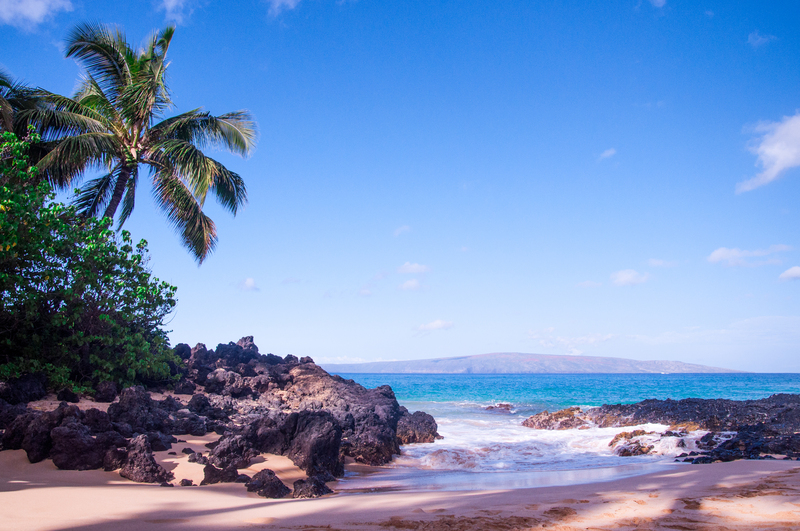 Aside from the resort itself, Secret Beach is my favorite place on Maui, thus, my absolute favorite place in the world. It’s as if someone extracted a video recording of my REM cycle, created a rendering, submitted it to heaven, put in an RFP to God and some angels, and then it was created. On the 8th day, God made Secret Beach, and He saw that it was good and that Dominique would like it. I think that’s how it went down. Unsure of details since I was kind of out of the loop but my deductive reasoning skills are pretty strong so I think it’s safe to say this is all accurate. 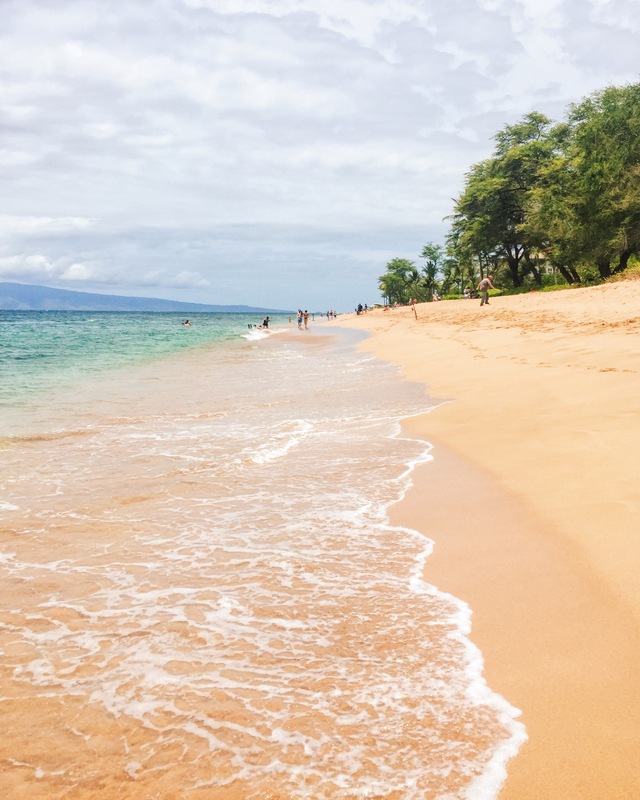 Secret Beach is just past Makena (south), and apparently it’s rarely visited (wtf why). The entrance is not very noticeable, it’s blocked off by rock walls with a door-sized opening leading you in. If you get there early in the morning, you’ll be treated to a tranquil, tourist-free beach, and your own little slice of heaven on the sand. 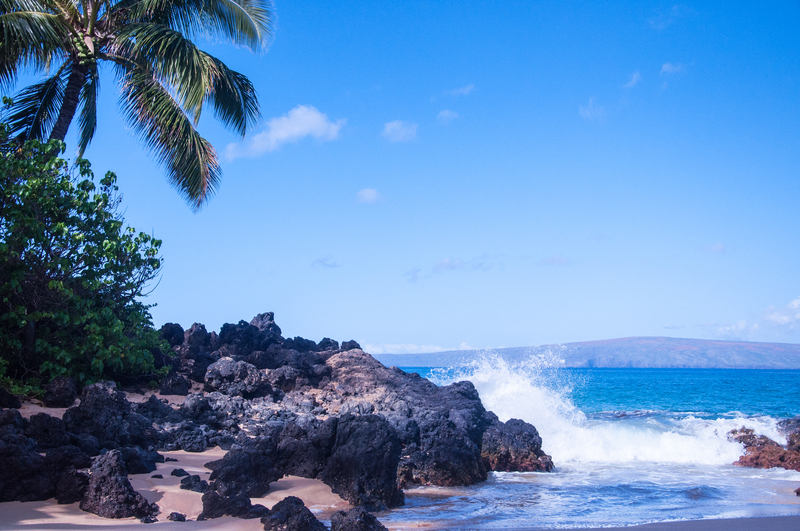 Picturesque lava rocks, slanting palms, shady trees, and just the right amount of sun as you look out to Kahoolawe. Not sure what’s on that island, TBH. On the side of the road, there are fruit stands, so you can get a fresh pineapple or coconut and bring that to the beach and just really soak up every second of the Hawaiian awesomeness. Suggestion: bring bug spray. I got MUNCHED. 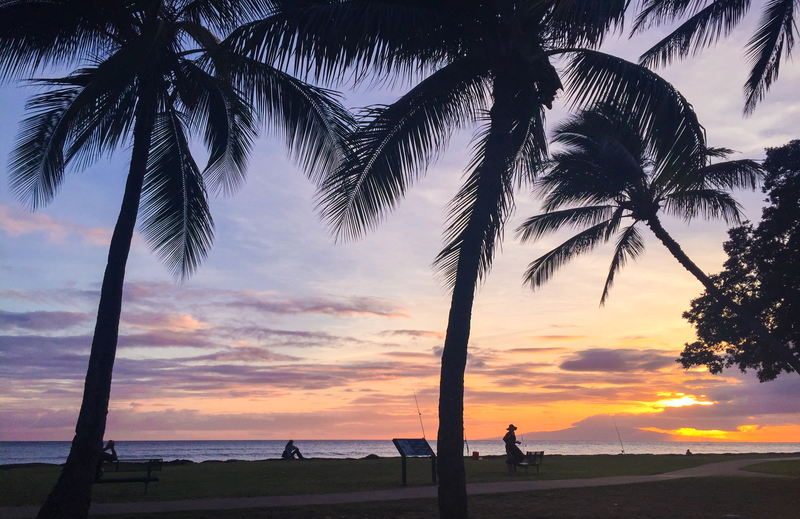 Before we grabbed dinner at Three’s in Kihei, we went over to the beach to watch the sunset and see sea turtles swimming around. I wept. One turtle was not so lucky and got knocked around by the waves and was flailing and I was like OMG SWEET TURTLE but he figured it out. Cool story, right? 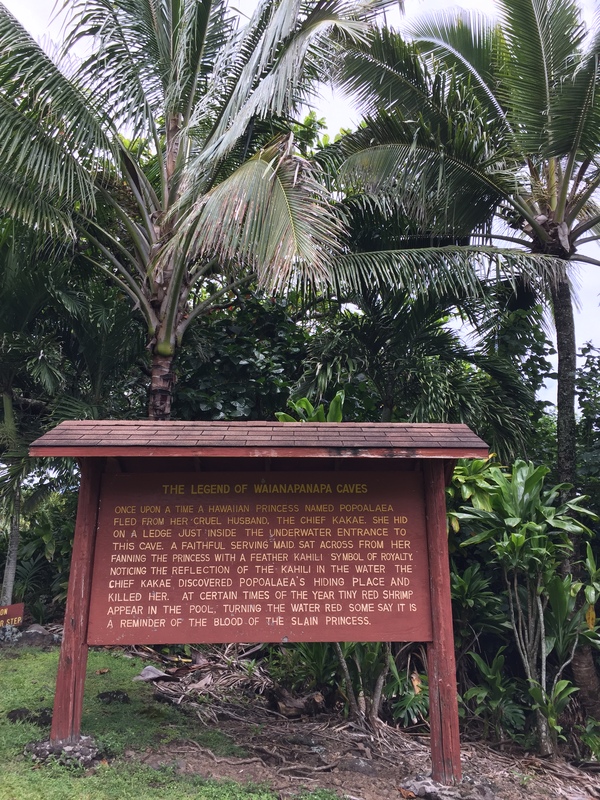 I could probably write an entire post just on the Road to Hana, but I’ll try to give you a quick overview here. 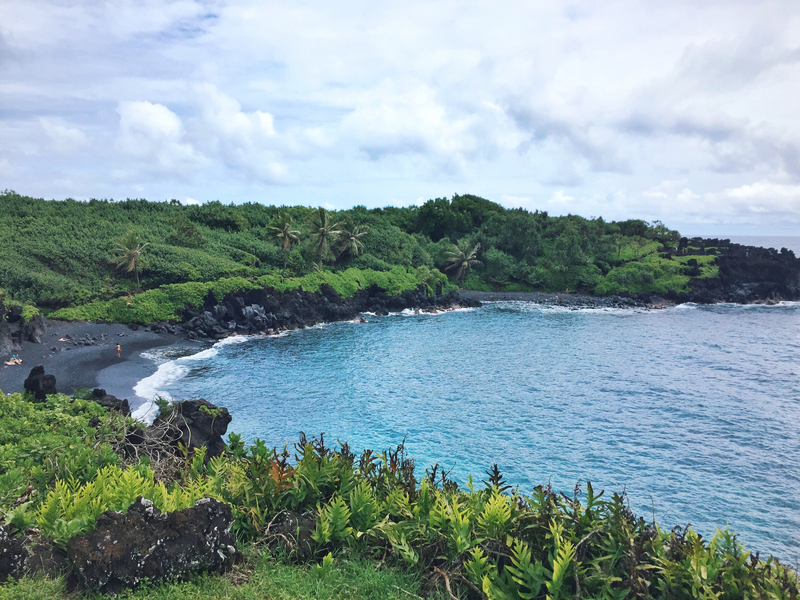 If you’ve ever imagined what the Garden of Eden might look like, drive the road to Hana. 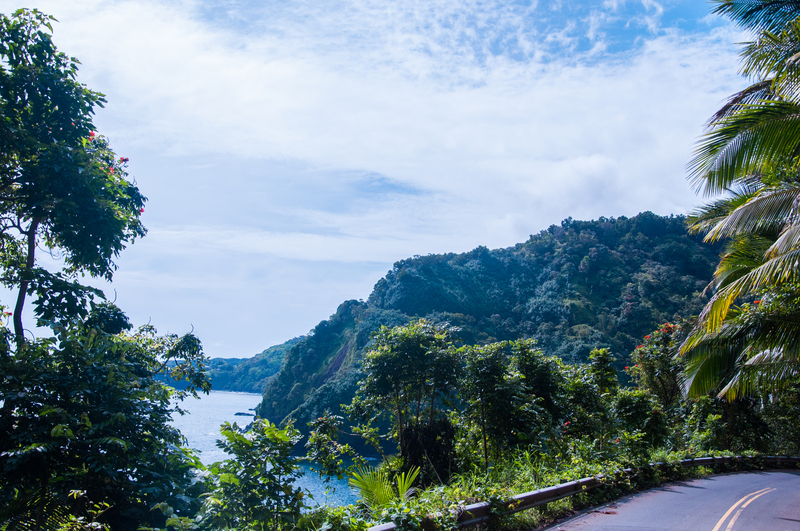 It is the most tropical, lush, vividly saturated, remote, breathtaking drive you can imagine. Waterfalls at every corner and crevice, colorful flowers, and over 600 turns around insanely gorgeous views — it’s like a tropical take on Big Sur but WAYYYY gnarlier. 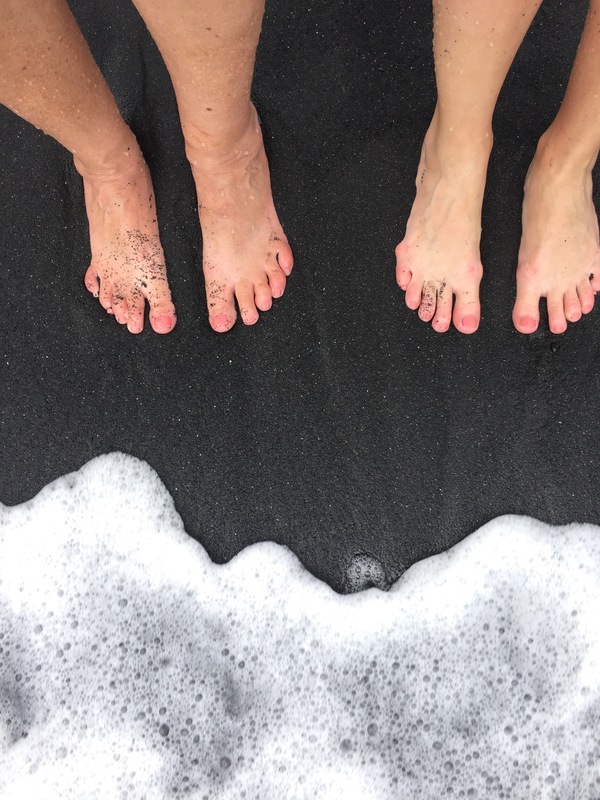 After trekking through some bamboo and rocky falls at mile marker 6, we made it to Wai’anapanapa State Park to see caves haunted by the ghost of a Hawaiian Princess named Popoalaea, and dazzling volcanic black sand beaches. 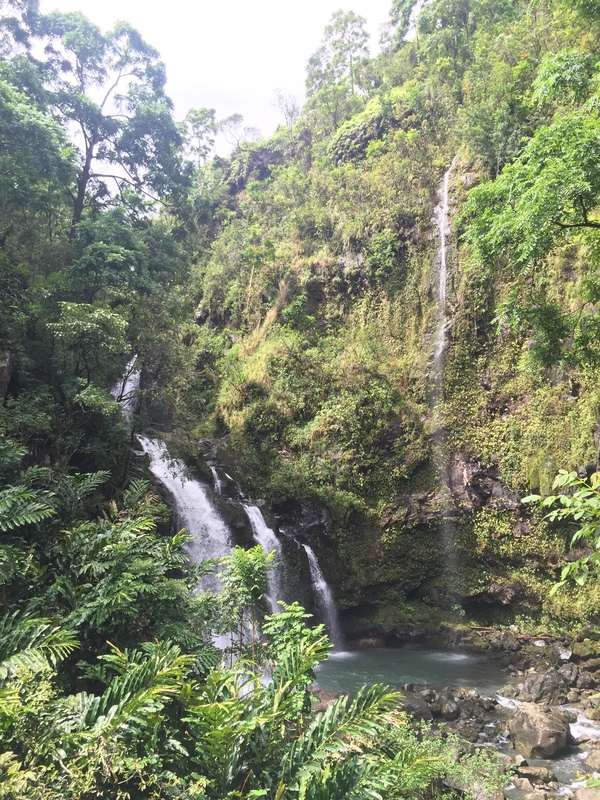 About 30 minutes past Hana is the ‘O’heo Gulch, where you can hike the Pipiwai trail up to the huge waterfalls at “Seven Sacred Pools.” I did not see the pools (honestly tho where are they) but we saw some killer waterfalls. 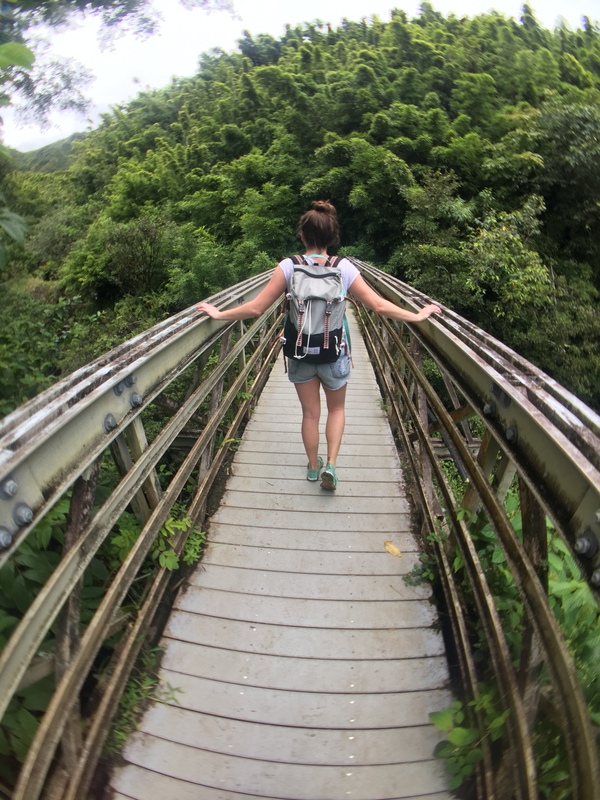 We hiked about four miles in total (there and back), through bamboo forests and mud, to see a natural wonder. BEHOLD. Covered in mud, soaked in sweat, walking through streams and getting in touch with the tropical nature was so surreal. It sounds so lame to say this out loud but I totally felt like I was one with Hawaii. 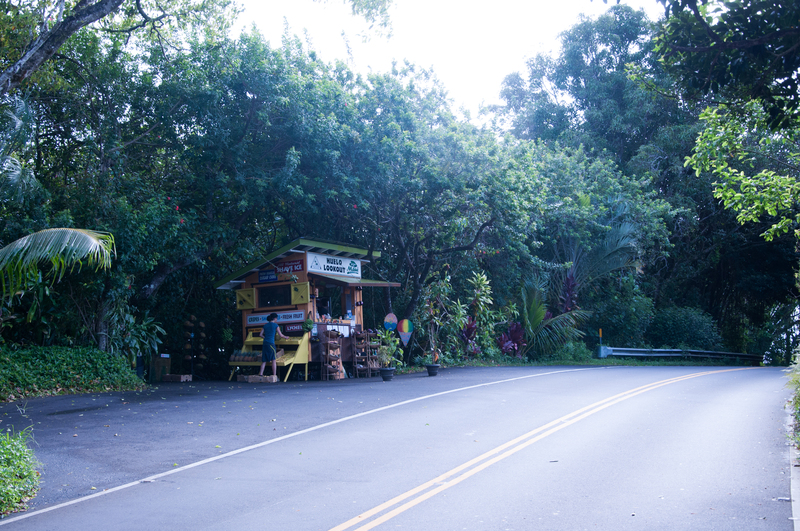 On the way back, we stopped at Hana Farms to get some fresh fruit — we had packed snacks for our trip, but were starving on the way back and didn’t really plan a place to get a meal. They were making pizza, which sounded bomb, but my mom and I wanted to get back to the resort and meet my brother for dinner. Expect to spend a full day on the road, with minimal cell service (i.e., bring a map!). We left at 6:30 am, packed snacks (not enough tho), filled up before we left town, had a phone charger and some downloaded music for the car, and went off on an adventure. Bring shoes you can wash or just get muddy, and some dry clothes in the car to change into if necessary (including dry shoes — potentially flip flops or whatever’s comfortable). There are dozens of stops you can make, so check the guide book I mentioned earlier or this site here to pick which ones you want to stop at! 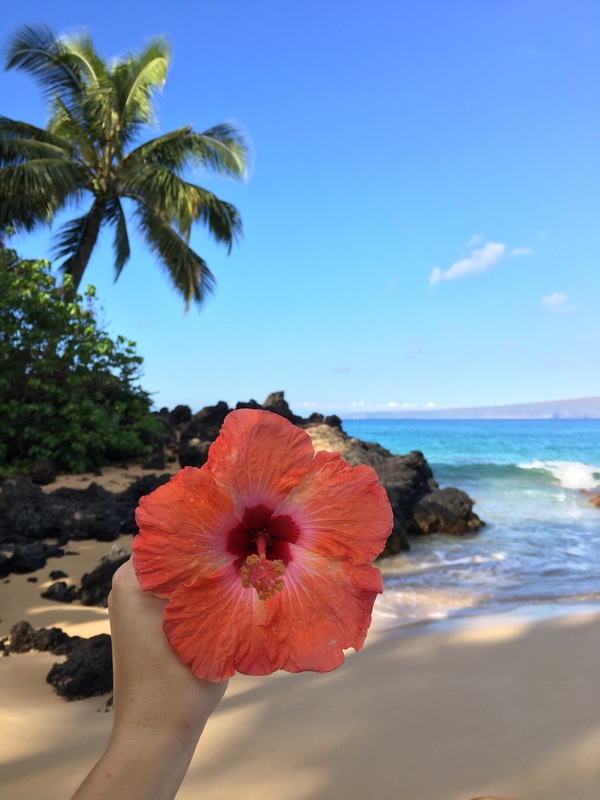 We cruised up to Lahaina to grab breakfast, check out the shops, get some shave ice, and spend some time at Kaanapali beach. We also ended up eating at Bubba Gumps, because my brother is a Landry’s employee and wanted to judge check out the other restaurants and how they operate… and get 50% off some food. 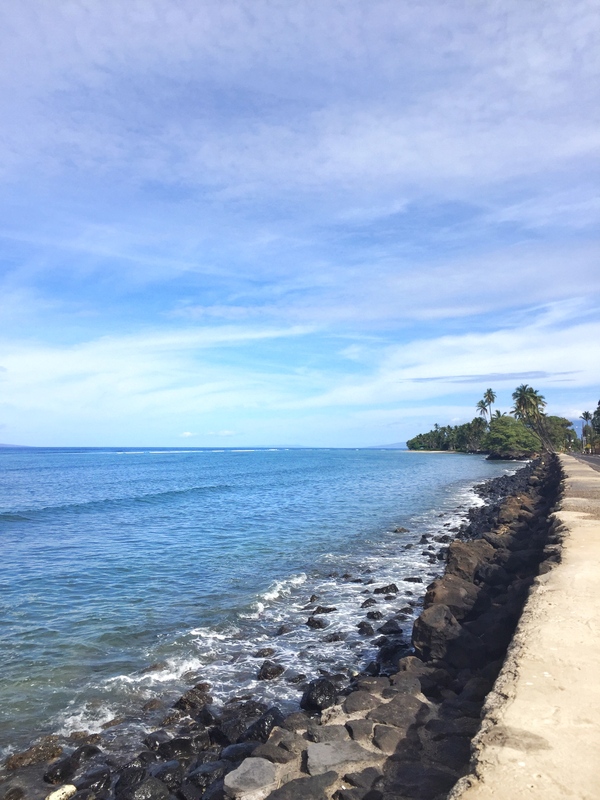 I wish we got a little more time in Lahaina, because I know there’s so much to do, but the time we did have there was really awesome. I got to see the Hurley store for the first time after staring at it for years via Instagram, which was exciting, and we grabbed some Ululani’s shave ice (more on that later). The town itself was really cute, and the beach was beautiful (no surprise there). I’ll definitely be back to explore more of this place! 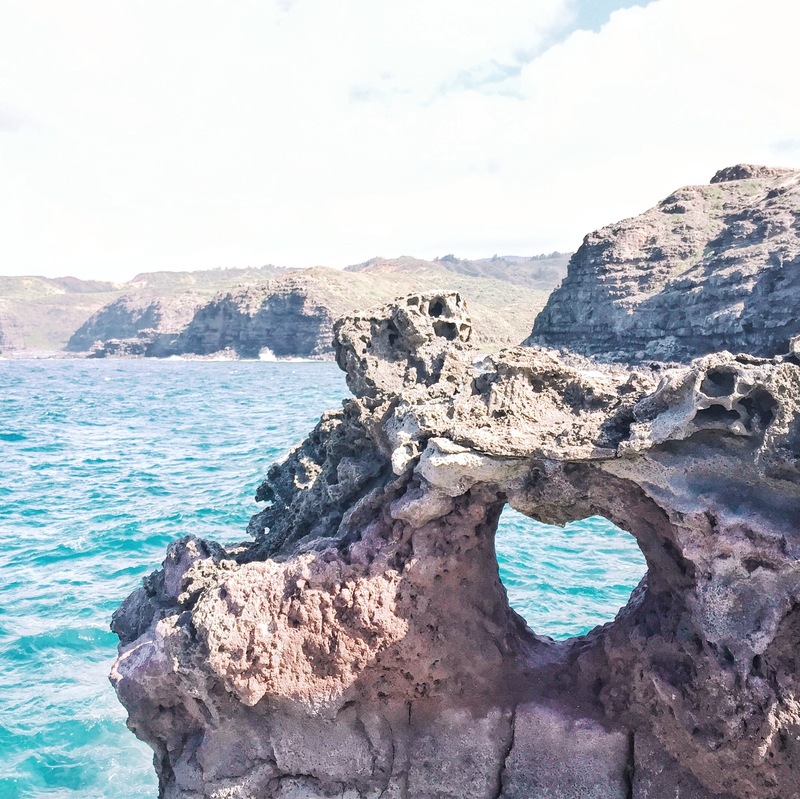 A stunning drive up to Napili brings you to the rocky Nakalele point, where you can see the natural blowhole and the heart rock. Heads up, I essentially had to parkour down some rocks to see all this — brother and mom were not into it, but I was able to slide and jump around in my chucks. It was worth it. Also, the locals want you to know it’s not a water park. 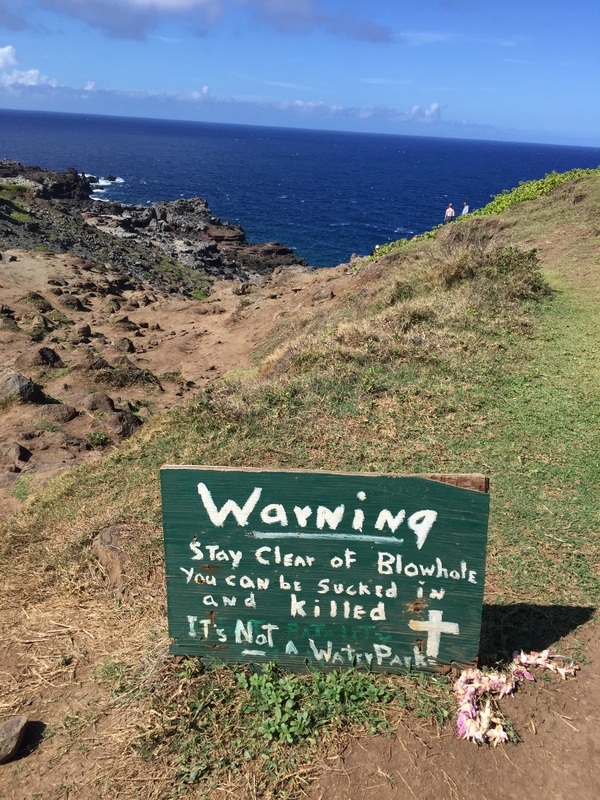 Approximately 30 people told me to eat at Mama’s Fish House in Paia, raving, claiming it was the best place to eat on the island, and if I didn’t eat there, I essentially f**ked up my whole trip. They didn’t actually say that, I READ BETWEEN THE LINES PATRICE. Just kidding. This is another place I could write a separate post about (tbh, I probably will). I took my mom here for her birthday and mother’s day treat — and it was worth every penny. This was our most expensive meal on the island, and rightfully so. The fish is all fresh, caught the day of. The menu lists a fisherman and a location from where the fish came. As someone who could eat ahi sashimi every day for the rest of her life, I was more than stoked when our waiter told us the special of the day was fresh ahi tuna. It was THE BEST. AHI TUNA. I’VE EVER EATEN. IN. MY. LIFE. OMG. It practically melted like butter in my mouth. Mom and I got the ceviche appetizer; then she got ono while I got the ahi special, and we both got Aunty Karen’s lemonade (liliko’i is everything to me), and ordered the Polynesian Black Pearl dessert — a ball of dense, rich dark chocolate mousse with a liliko’i cream center, sitting in a cookie clam shell, with a sprinkling of coconut. I believe this is what Jesus serves at his birthday party in heaven. For mom’s birthday, they brought her this incredible honey ice cream with fresh fruit. Every single bite there was dreamy. Two cocktails, an appetizer, two entrees, and dessert rang in (with a 20% tip) at about $225. But as many before me had insisted: if you eat at any restaurant on the island, eat at Mama’s. Get there early. Get a drink. Watch the sunset. Relish in every second, every bite, and in every inhale of that heavenly ocean breeze. I almost felt like I was in San Francisco at Monkeypod in Wailea. Our waiter spouted terms like “grass-fed” and “organic” and “local,” (locals only?) which led me to be very excited about the foods on offer. We got the signature Mai Tais, complete with liliko’i foam (OMG, worth the trip alone), some truffle fries, pork tacos, a grass-fed burger, and a pulled pork sandwich. My family split the burger and tacos while I kept the pulled pork ALL TO MYSELF. Tangy, spicy, smoky, and sweet, all in one. Unreal. So flavorful, tender, and delicious. Lastly, don’t leave without getting the strawberry whipped cheesecake — it’s on another level. I might be crying thinking about it. This place is moderately priced — less expensive than a resort, more expensive than a chain restaurant. Did not feel that it was particularly overpriced. God bless all the people who recommended this place. 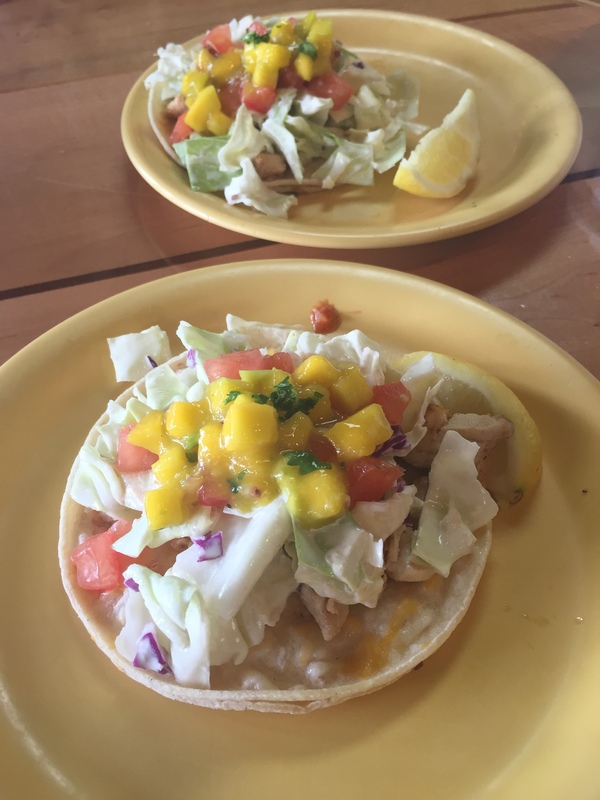 Coconut’s Fish Cafe is in Kihei and serves the best fish tacos I have ever had in my life. Go to this place, eat all the tacos, then cross the street and go to Maui Pie (more on that below) to get a haupia pie, and you can die happy. Our first night we ventured to Kihei thanks to our bellman Keith’s suggestion. At Three’s, we got a kalua pork quesadilla (mom), a tropical salad with coconut shrimp (me, obvi), and a chicken stir fry (brother). Service was a bit slow, but we weren’t in a rush, so overall the experience was pretty nice. I loved my salad and the quesadilla was great. This place is a bit expensive, so plan accordingly. This place was recommended to us by a few friends, and it was the first place we stopped after we deplaned. We grabbed some pineapple coconut and banana macadamia french toasts and POG, and we weren’t disappointed. It’s a little hole in the wall place with friendly service, and yummy breakfast. Not super pricey, I think it was about $9 for each plate. 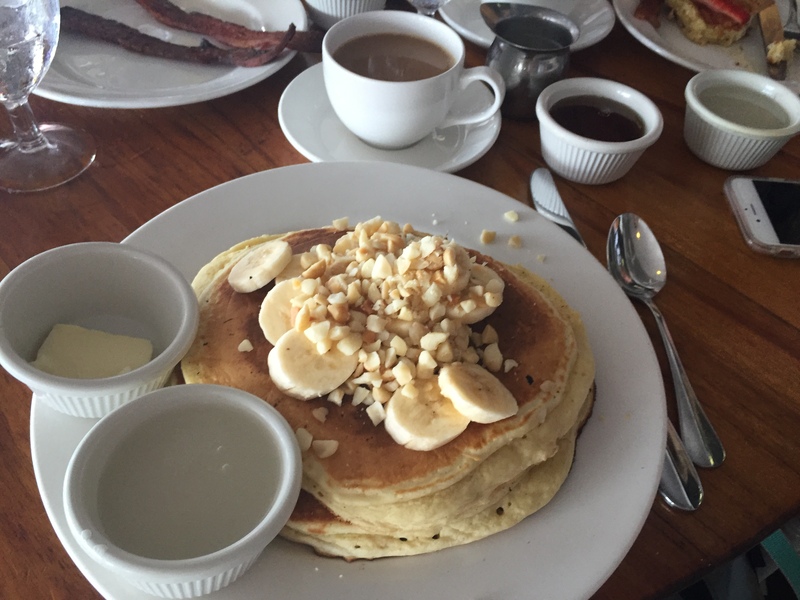 Perhaps our favorite breakfast on the island was at Longhi’s in Lahaina. The best pancakes and french toast we’ve ever eaten were accompanied by super thick slices of bacon that may have possibly been pork belly. 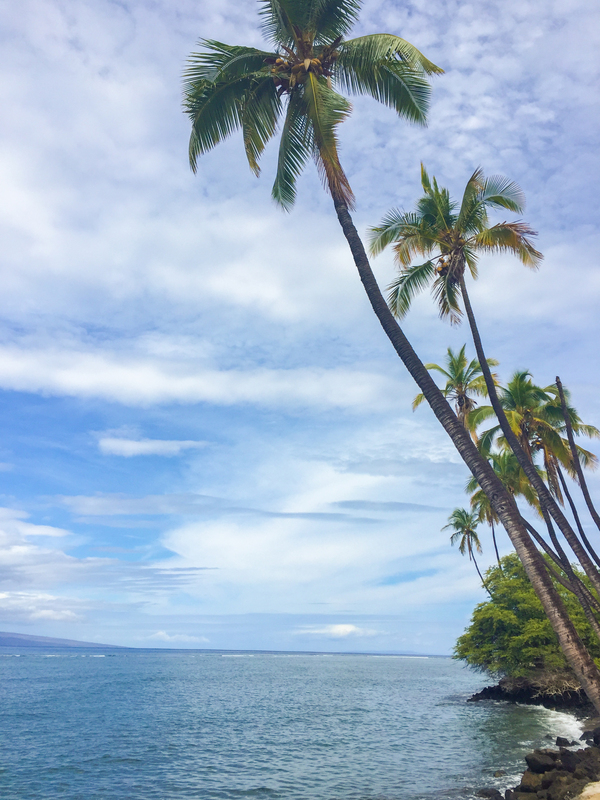 The place is phenomenal — a charming, whitewashed wood beach cottage overlooking a stunning strip of ocean in Lahaina (above). Breezy, bright & light, calm, quiet, and offering a fantastic menu. I also put coconut syrup on everything. It’s not cheap — $17 for two pancakes is up there — but I thought it was super worth it, and I’d return again in a heartbeat. The Tommy Bahama dinner on our last night was a bit of a wildcard; we didn’t really plan our last supper, and didn’t want to drop a ton of money at the end of the trip, which meant no Humuhumunukunukuapua’a Restaurant for us (guys, I spelled that correctly first try without looking …. AM I A LOCAL YET?!). I am certain my family avoided this place with the firm belief that I’d order the surf and turf and three liliko’i bellinis, thus bankrupting us via my gluttonous frivolity before the vacation was over. Anyway, I was talking about Tommy Bahama. The food was great. We loved it. The service was even better. The manager became our BFF and even gave us a free chocolate pie. They have an excellent Pain Killer cocktail, one of my favorites (naturally) which is coconut cream, pineapple juice, rum, orange juice, and a bit of nutmeg. I got a grapefruit and jicama salad with macadamia nuts, and a thai shrimp and scallop dish that was really, really delicious. We didn’t get a full meal at Bistro Molokini, but my mom and I walked up from the pool to get poke nachos (holy sh**) and a piña colada. 10/10 would recommend. The view (above) and atmosphere is worth the trip. 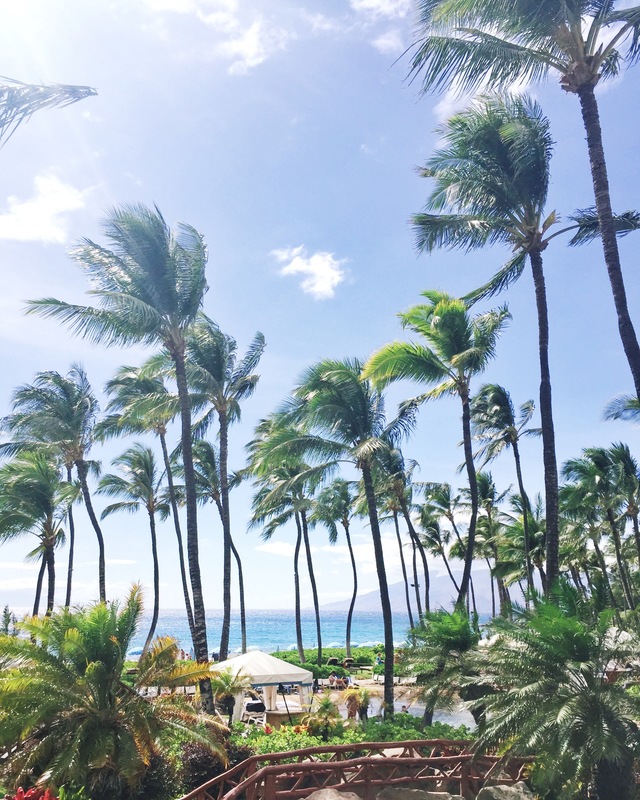 Sit outside on a breezy balcony in the warm Hawaiian summer air, and treat yourself to an all-you-can eat breakfast or brunch in the sunshine. Fresh juices, eggs benedict, waffles, oatmeal — as per usual, I put coconut syrup on ALL OF IT. Somewhere around $30/person. This little cafe kept right in line with the “Dominique, The Theme Park” guidelines by serving açaí bowls and pancakes with haupia cream. They open early, and have resort-priced breakfast and snacks. 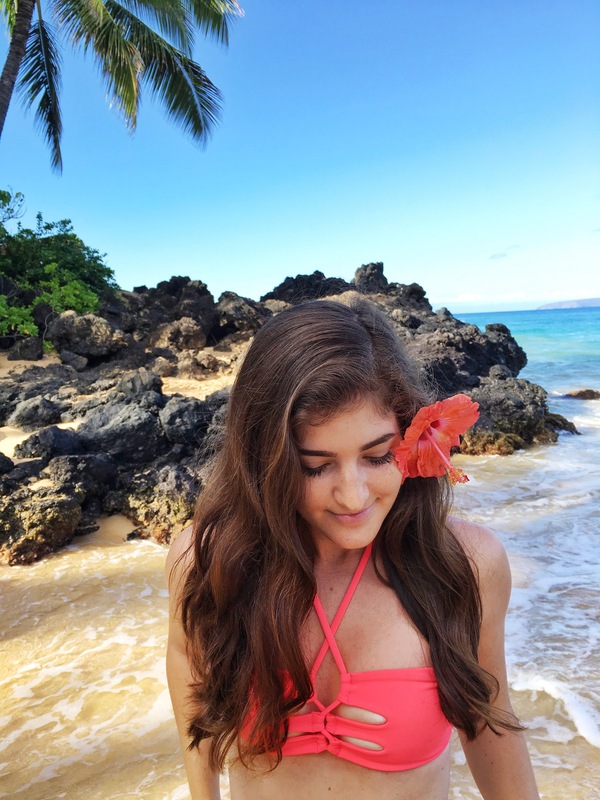 Ululani’s offered me a job and for a brief moment I considered abandoning everything I’ve built for myself in favor of a life of shave ice and Hawaiian dreams. That daydream lasted about 4.7 seconds before I was mentally, physically, emotionally, and spiritually immersed in the confectionary perfection below: This, my sweet friends (mom are you the only one reading this? 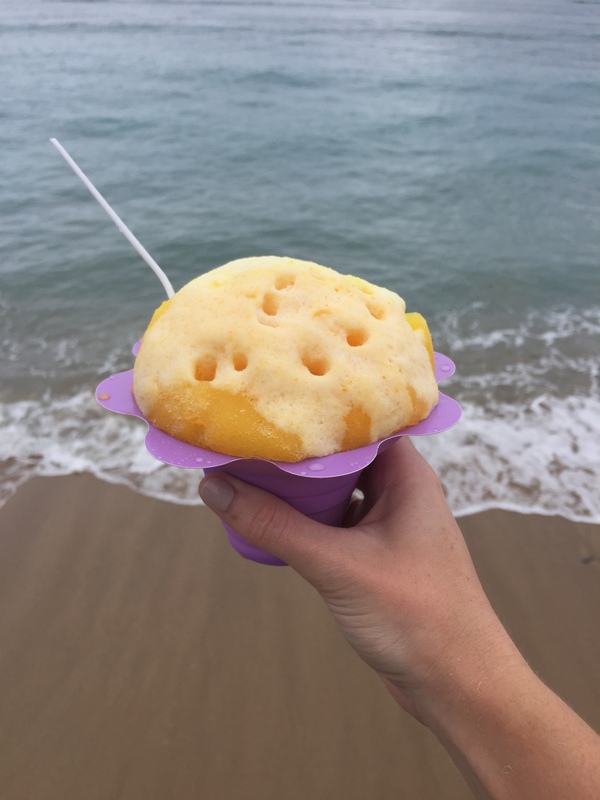 unclear), is a pineapple liliko’i shave ice, on a bed of haupia ice cream, topped with a sweetened condensed milk “snow cap.” It is everything and more, and every bite reminds you that there is a reason for living. It is glorious, it is good, and if you don’t get one while you’re in Maui, I question who you are as a person. Ohhhhh the haupia pie. How in love I am with this miraculous pie. A coconut pudding layer under a chocolate-coconut cream layer, in a flaky pie crust, topped with whipped cream. Sweet. Baby. Jesus. 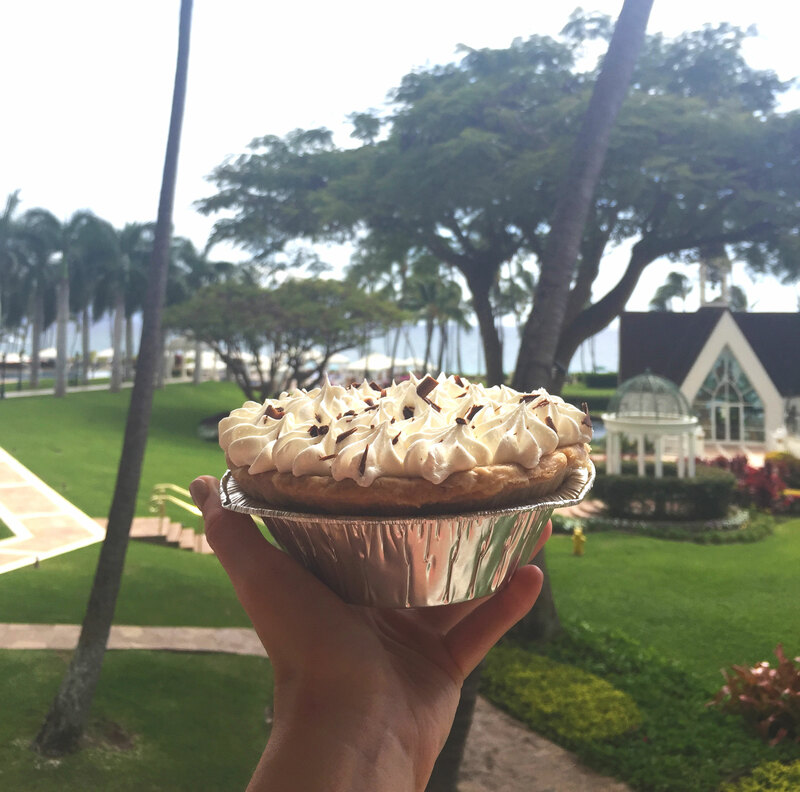 Haupia pie is one of my favorite desserts, and Maui Pie in Kihei did not disappoint. This mini pie was perfectly crafted by angels who love me. I know it seems like I love everything, but it’s only because I love everything. We had a stellar dining experience in Maui, and I have zero disappointments to report back on. Apparently, we didn’t even scratch the surface, so you know that you can’t really go wrong with food here. I’m not a huge souvenir person. I collect Starbucks “You Are Here” mugs (hey, fun fact!) because I’m weird, so I grab one of those during each vacation. I also like to get a Christmas ornament to go on my (surprise) tropical/nautical themed tree. Sometimes I make it myself, like last year when I brought back some sand from Tulum and filled an empty glass ornament, and decorated the outside with a paint pen. This year I grabbed some kitschy yet perfect flower ornaments that say mele kalikimaka. I’m v pleased. However, despite my aversion to most souvenirs, one of my favorite ways to remember a place is by different smells. I brought back a home and linen spray (plumeria scented, suprise again) from Coqui Coqui in the Yucatan. 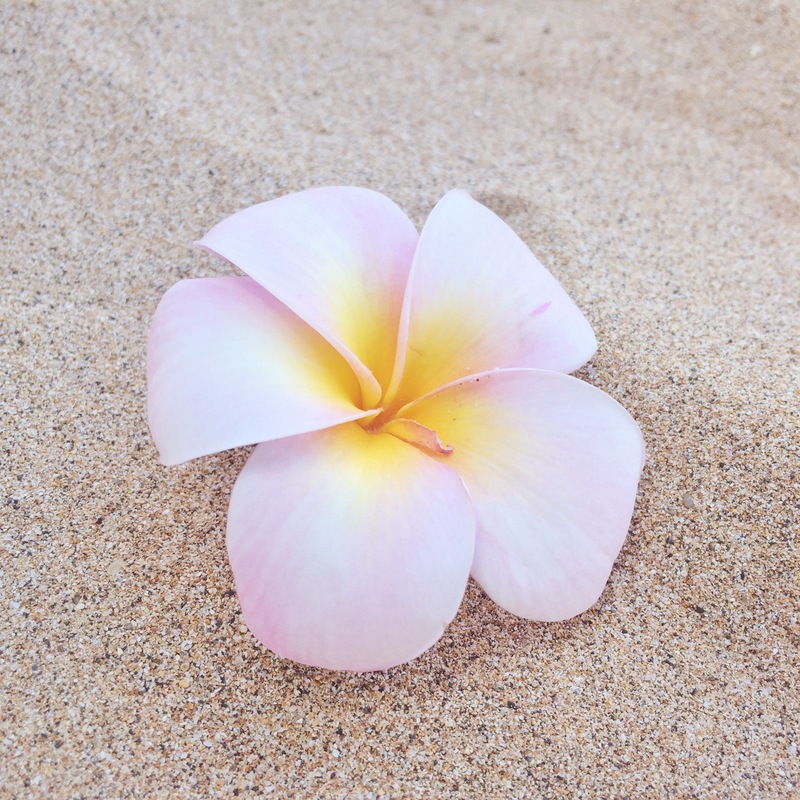 So in a similar vein, I took home a scented lotion from Maui — but this time it was for more than just nostalgia. A woman working at the watersport rental booth at the resort gave me a sample of Absolutely Natural Rosehip Aloe Lotion. It smells fantastic, yes, but it also completely saved my skin from a fierce sunburn. I was stunned, marveling at how my skin healed literally overnight, going from a deep, painful red, to a mildly tinged pink. The stuff. is. SORCERY. Lastly, per a suggestion from a friend (and her request for some for herself), I went to the ABC Store to get a two pack of pineapple gummy bears. As said friend described, each one is like a bite of Maui sunshine and happiness. It helped ease the transition into mainland life, and I highly recommend grabbing a bag or two before you depart from your trip. The best thing you can bring back is photos. I’d recommend getting a Hitcase or GoPro, and a decent camera if you’re into stuff like that. The photos will bring you a lifetime of memories and joy. You guys, even though it seems like I did a lot on this trip, there is SO much more to do and see on just this one little island. It is now my life’s mission to go back to the islands as many times as humanly, physically, financially, and transportationally possible before I die. In fact, I may forego purchasing a home in the mainland in favor of acquiring a timeshare in Hawaii🌴 thank you to all my friends and family who suggested activities and places to eat!! I hope this inspires you to plan a trip of your own, or if you’re already going, maybe you’ve picked up a few things to add to your itinerary. Either way, you should be in the spirit by now… :) I’ll be busy planning my next escape to the best place in the universe.